With the XXII Winter Olympics now underway in Sochi, some viewers (especially those who remember watching Peggy Fleming, Dorothy Hamill and the Heiden siblings) may experience a bit of disconnect with several of this year’s events. What on earth is the ski halfpipe or snowboard slopestyle, anyway? Fiddling with the event lineup is nothing new, though the chart makes clear that the trend has been more about adding than dropping events. (Some of the events you’ll miss out on this year are skijoring, sled dog racing and bandy.) 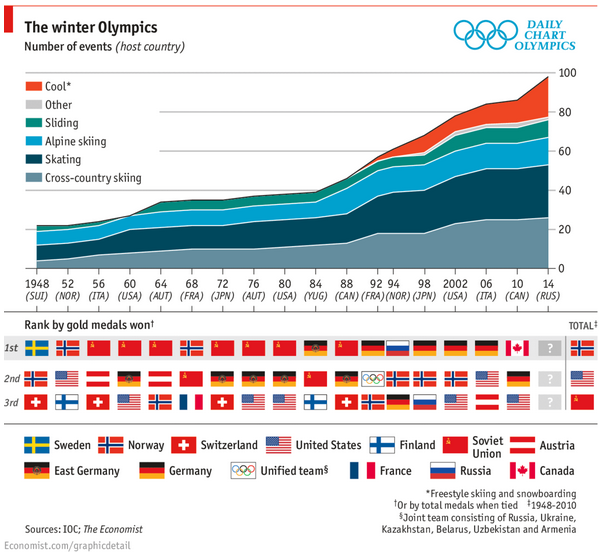 Some of that expansion has been a consequence of opening many sports that for decades were men-only to female athletes (that’s our silver medal Chart of the Week). For the first time this year, for instance, women will compete in ski jumping.